How to Identify the Top Converting Channels Using Attribution Modeling in Google Analytics? Attribution modelling lets you identify the conversion paths that lead to successful sales and conversions. You can compare the channels of interaction using the model comparison tool and find out which channel is leading to maximum sales. You need to have an idea of multi channel funnels before you can understand how attribution modelling works. So, here is a quick guide to multi channel funnels. After you have finished reading this tutorial and understood the concepts behind first interactions, assisted interactions and last interactions, you may read ahead in order to understand deeply about attribution modeling. Attribution Modeling calculates the credits given to a particular channel that assists in conversions or that has the maximum role play in generating conversions. In this type of setting, the credit given to any channel/channels of conversions depends on the type of attribution model used. By default, Google provides 8 different types of attribution models. Let us learn them one by one. Following 8 kinds of default attribution models are present in Google Analytics. Let us take an example and see how each model affects the value of conversion. Suppose, I sell chocolate cakes online. I use seo, paid search, social media and email marketing as channels in my online marketing campaigns. Now, I wish to identify which channel is providing me the maximum conversions. I also understand that Direct visits is also a channel which Google tracks. People visiting my site directly may have learned about it through any of the channels present in my online marketing campaign. So, I will track that also. A customer finds my site by using organic search. After a day the same customer clicks on my adwords ad and finds out more about my company. Another day passes and now the customer visits my site through a social media campaign and registers on my site. Remember, actual sale has not happened yet. Now, the customer already knew about my brand and services. He again visits my site through my email marketing campaign that I usually send to my registered users. But, alas conversions still not happens. After another day, the customer visits the site directly and makes a purchase. Yippy! I got one conversion. As you can see, there were so many channels involved in making a conversion happen. If there are 100 conversions happening on my site each day, how can I find out which channel is helping me in increasing my ROI? The answer is, with the help of attribution modelling and the model comparison tool. Last Interaction: As per the example given above, Google will give 100% credit to the direct channel because it was the last interaction right before the conversion. Last Non Direct Click: Here, Google will give 100% credit to my email marketing campaign as this was last channel to send me non direct clicks. Last Adword Click: In this model, my adword campaign would be given 100% credit for the conversions as it was the only adword click to happen in the entire conversion process. First Interaction: Remember, the first time the customer visited my site was through organic search (SEO) so organic search would be given 100% credit for initiating the conversion. Linear: In this model, each of channels involved in the conversions would be given equal credit. In the example above, 5 channels are used namely organic search, paid search, social media, email marketing and direct traffic. Hence, each of these 5 channels will be given 20% credit each. I always prefer this mode of measurement because it gives me a rough overview of the channels that are playing an important role in making a conversion happen. Time Decay: In this model, the channels that are closest in time to the sale will get the maximum credit. Similarly the channels that are far in time to the sale will get less credit. Here, the direct channel and the email marketing campaign will receive the maximum credit while organic search will receive the least credit. Position Based: The first and the last interactions are given 40% of the credit and the assisting channels are given the remaining 20%. This gets divided equally between each of the assisted channel used. 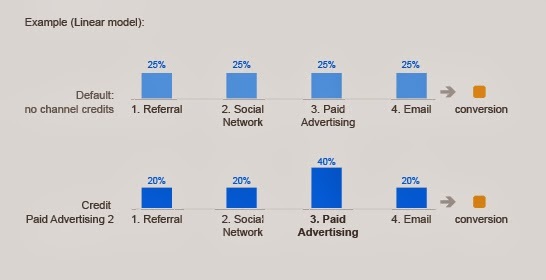 Here, Organic search and email campaign will receive 40% of the credit and the remaining 3 channels namely paid search, social media and direct channel will receive around 6.6% credit each. You can use the model comparison tool in Google Analytics in order to compare the attribution models. You can find the model comparison tool under Conversion tab in the Attribution section. Here you can choose any of the models and compare them by setting the number of days in the look back window. By default, the lookback window displays 30 days. It can track a maximum of 90 days.